Taking a shower takes up your time, energy and water, and then leaves you to deal with your soaking wet body and hair. And there are days when that’s a far bigger commitment than we can handle. Taking the occasional waterless shower is a great way to achieve shower-fresh status without getting wet. Plus, you’ll nourish your hair with natural oils and save water. Here’s how to complete a typical shower routine sans eau. This step is for all the body and face scrub fans out there who crave baby smooth skin, but it’s an optional step. For everything below your décolletage, give dry brushing a try. All you have to do is gently brush your skin with a body brush. Dry brushing will not only remove dead cells, it’ll also increase blood flow. 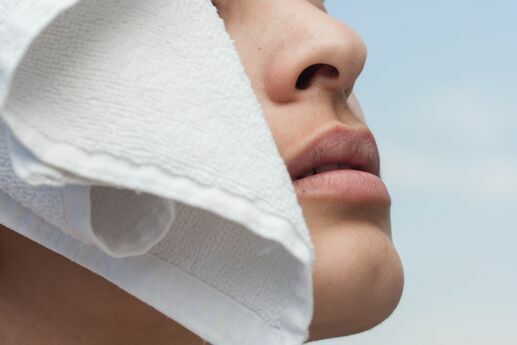 For your face, neck and chest, you can use a clean washcloth to rub even more gently. If you want to master of the art of laziness waterless showering, you’ll need to invest in cleansing cloths. These little guys will make your life so much easier. All you need to do is wipe your body and face down with wipes. Give special attention to your more aromatic areas (armpits) and don’t forget to wipe behind your ears. Some people like to finish showers with a little powder; for example, baby powdering their underarms. The cleansing cloths will offer just enough moisture for powder to be absorbed if you’re into that. However, the real star of the waterless shower is dry shampoo, an oil-absorbing powder for the hair (it typically comes in an aerosol spray). Apply dry shampoo to greasy roots, bangs, etc., and no one will even guess you skipped a shower. It’s like magic. Apply lotion or body oil to your skin as you normally would after a shower. However, since you didn’t soap up, chances are you won’t need as much, so proceed lightly. If you want to add a little extra luster to your hair or went a tad too far with the dry shampoo (it is pretty fun to spray! ), add some oil or styling cream to the ends of your hair. Stick to the bottom three-quarters of your hair, though, because putting product too close to your roots will undermine your water-saving dry shampoo job. Apply your usual deodorant, essential oil or perfume. It may sound obvious, but applying deodorant to clean underarms will keep you fresh longer. Also, scents from oils and perfumes will last longer on moisturized skin. I know this is a no-brainer (and should apply even after a wet shower), but it has to be said: Make sure you wear clean clothes (undergarments especially). And there you have the waterless shower. For an even lazier stealthier waterless shower, keep dry shampoo and cleansing cloths on hand for quick, on-the-go freshening.